Formed in México City, México in 2006, originally as a reunion of an earlier band called Erógena. Upon auditioning singers, and the eventual hiring of Dulce Robles, the Vitruvius concept came into being. After releasing its self-titled debut in 2011, the band relocated to Xalapa, Veracruz. "Above the Silvered Sky" arrives after a half decade hiatus. Originally slated for release in 2015, the album was finally released this year - and was criminally overlooked by the corporate metal press. The band name comes from 1st century BC Roman author, architect, civil - and military engineer Marcus Vitruvius Pollio, commonly known as Vitruvius. Vitruvius is known for his multi-volume work entitled “De architectura”. The tome is considered one of the most important sources of modern knowledge of Roman building methods, as well as the planning and design of structures, both large and small. 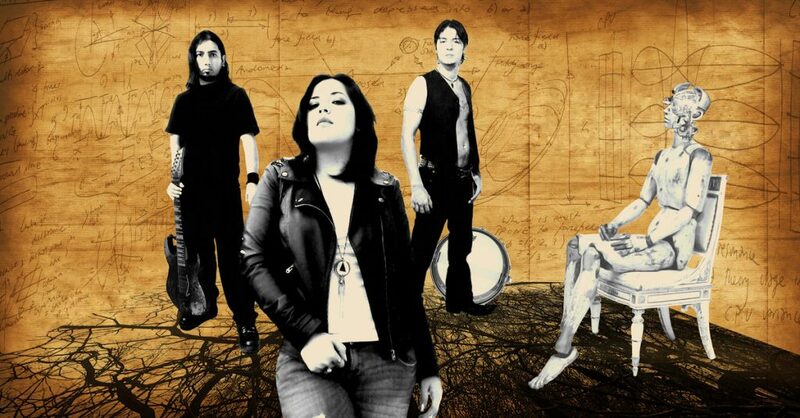 In its current form Vitruvius consists of Dulce Robles (vocals), Oskar Villareal (lead, acoustic guitar, bass guitar), and Ronnie Rodriguez (drums) with Lucas Espinoza providing studio keyboards and piano. Oozing with Latin American warmth and graced by the sensual vocals of frontwoman Dulce Robles, on "Above the Silvered Sky" Vitruvius is neither excessive nor bloated. Vitruvius delicately balances technically advanced sections with more vocal-centric segments and tranquil moments. Robles on her part eschews the trappings of more typical singers, and never overcompensates. Her emotive delivery will always outclass her operatic counterparts. Villareal and Rodriguez are the obvious selling points for the record. The trio’s greatest strength lies in its sense of moderation. That moderation is reflected in its compositions, which never become too ambitious for their own good. All tracks stay within manageable length, only 'Uncertainty' is the exception as it reaches and surpasses the 8-minute mark. On tracks as 'The Maze' Vitruvius comes within vicinity of Hungarian genre act Dreamgrave, but never quite reaches the same level of mastery. 'Forgotten Smiles' was released as an advance single in 2015, and was a good indicator of the direction for "Above the Silvered Sky". It is unfortunate that none of Vitruvius' Latin American heritage seeped into the music. The album was recorded and mixed at Jaxx Studio and Magic Hat Audio. "Above the Silvered Sky" was mastered at Beacon Soundworks Studios in Beacon, New York. The production is economic in that it gives each instrument its required space, and balances them adequately against each other. Forgoing the digital sheen and smooth gloss of higher budgeted acts "Above the Silvered Sky" sounds incredible in its sparseness. As before the album is adorned with a stunning digital art piece for its cover. 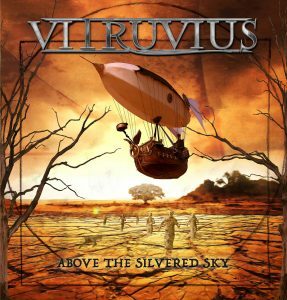 Vitruvius is rigorously disciplined on "Above the Silvered Sky" as it stays well within the perimeter of the progressive metal genre. The trio is at its strongest at its most fragile. Neither is this a record to challenge anybody’s perceptions of the progressive metal genre. Vitruvius is comfortable with its position in the underground, and seems content at its place in its regional scene. "Above the Silvered Sky" should appeal to fans from the early works of Dream Theater and Symphony X. It is great to see México excelling at other genres outside of death – and black metal. Of the two Disgorge branded units active at the end of the ‘90s, the Mexican variant would ultimately prove to be the most resilient in the face of line-up alterations, label changes and life’s general difficulties. Although the American offshoot was arguably more popular instantly with a large audience in North America and Europe due to their debut record “She Lay Gutted” and its two largely similar follow-ups, their Mexican namesake owed more to a classic British death metal lineage, namely that of British proto-goregrind pioneers Carcass (and its first two albums), while its groovier sections recall blue-collar bruisers Benediction, in particular “The Grand Leveller”. To what extent do Disgorge ape their more popular British inspirations? On every conceivable superficial level to be exact. The song titles and lyrics contain the same amount of medical jargon that Carcass was known for, and while it is hard for a layman to make much sense of either these things - Carcass seemed to have an actual point with their gimmick. Disgorge on the other hand just seems happy and willing enough to copy it on face-value level without much thought put into it otherwise. The sickening cover art photography of a disheveled autopsied human corpse on a medical slab is expectedly gruesome, and well, tasteless at that. Musically, Disgorge largely go for the “Symphonies Of Sickness” sound. The vocals alternate between indecipherable low grunts and bowel-churning shrieks. The riffing mostly recalls early Carcass, Napalm Death and even Mortician in parts. The playing is frantic and mostly at breakneck pace – but thankfully Disgorge understands that there’s sense in slowing down every once in a while. These slow sections work surprisingly well within the provided context, and had the band put more emphasis on them through out this debut album would have been far more memorable. Like Mortician this band also uses stock samples of lesser and well-known horror movies. The most recognizable seems to be “Children Of the Corn” which opens the album in a fittingly macabre way. The emphasis is squarely on the level of brutality and speed, and while the playing is reasonably technical – the level of musicality and songwriting is subpar to say the least. Why is the songwriting subpar? The biggest complaint is that these songs tend to go nowhere, or offer no notable payoff for the few things they set up. The band unleashes torrents of ungentle riffs, bursts of aggressive power chords and a true avalanche of blasting drumming, but the end result are songs that are painfully mediocre and woefully underwritten. The songs feel disjointed and chaotic for no other reason than being disjointed and chaotic. At times it’s even hard to tell where one song ends and another one begins. There’s little flow to the record, and only the occasional groove segment or sample will make the song in which they appear stand out for a second or two. Since there are no guitar leads/solos, the riffing bleeds together and coupled with the low grunting it is at times impossible to tell whether you are hearing the vocals or the sparse presence of the bass guitar. The American Disgorge, for all the critiques one can reasonably level at them, at least had a distinct songwriting style and songs that can at least be superficially told apart. The Mexican Disgorge has none of that, sadly. This doesn’t change the fact that Disgorge weren’t doing anything remotely new at the time. No. By this time you had Exhumed and Impaled (which pooled talent at various points) leading the charge out of California. In the early 2000s the Exhumed side-project The County Medical Examiners, led by Matt Widener under the pseudonym Dr. Morton Fairbanks, made a splash in the international scene by shamelessly copying early Carcass. So did Belgian bruisers Aborted with their early records in the early 2000s, especially with their third and very “Necroticism” inspired outing “Goremageddon”. In Stockholm, Sweden there was General Surgery who had been doing this thing simultaneously with Carcass all the way back in the late ‘80s. Spain had its own worship act with the always-reliable Haemorrhage. The early signings of American underground label Razorback Records were all Carcass clones of various stripes and color. Just to illustrate that Disgorge was not reinventing its subgenre of choice, nor was it attempting to shake things up by doing things differently within a given genre trope. The biggest weakness of this album is its basement bargain production. The drums feature most prominently in the mix, and there’s a surprising amount of bass presence thanks to both the kickdrums and the bass guitar. The guitars for some reason are mixed deeply under the drums, and when they shine through they don’t come with the expected weight and crunch. No, these guitars sound rather thin, trebly and muddy. The guitar and bass playing are extremely tight and precise, while the drumming tends to get sloppy and sometimes even struggles to keep up with the high tempo of the guitars. On the whole the production is uneven, garage-like and misses balance to give each instrument its required space in the whole. This isn’t a professional production in any way, and often it sounds like a more expensive demo recording, but nothing more. The album was recorded at Tequila Studios with engineer/producer Hans Mues, who worked earlier with local underground stalwarts Anarchus, Cenotaph and The Chasm. 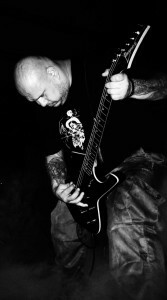 Disgorge at the time consisted of the hulking and heavily tattooed Antimo Buonnano on vocals and bass guitar, Edgar Garcia on guitars, and one Guillermo Garfias on drums. This was the original line-up that comprised the band’s demo phase from 1994 to 1997. One year after this album, in 1998, another promo would be recorded using this constellation before inevitable personal problems led to a schism in the ranks. Buonnano has since kept mainly busy with various black metal projects, while keeping his love for death metal alive with Blood Reaping and Demonized. After Buannano’s departure guitarist Edgar Garcia would take up the vocal duties. Garfias would play drums on all albums up to and including “Gore Blessed To the Worms” from 2006, after which he was duly replaced with Edgar Garcia’s younger brother Oscar. He has no relation to his more popular American namesake from Terrorizer’s “World Downfall”. For reasons that currently elude me this is considered to a crowning achievement for the Mexican underground scene on an international scale, although I fail to see why. While this band is as brutal and unforgiving as they come, the songs tend to drone on and on without notable payoff or climax. Neither seems Disgorge to work around a central concept, other than ghastly medical procedures and assorted subjects. Unlike early Carcass there isn’t a whole of musicality to these cuts, and they don’t appear to be structured for maximum impact either. The vocals are largely forgettable, and outside of one or two especially sickening shrieks or pitch-shifted wails nothing of note is offered. The lack of guitar leads/solos also tends to make these songs run together. The fact is that there were more deserving Mexican death metal acts around at the time, such as the occult sounding and greatly atmospheric Cenotaph, who had several demos out around this juncture. However, “Chronic Corpora Infest” is good for what it is and all the things that it isn’t. Disgorge is mostly brutal for its own sake, and the music poorly reflects that. As far as Carcass clones go, this isn’t the best but there is far worse out there.